The renascence is coming for front-end developers. A great success of Angular pushed the Google team to create another version of this framework. Huge feedback from the community made a big impact on Google’s approach to creating it. Angular 2 was written in TypeScript because of the advantages that come with the types system. It also supports ES5, ES6 and Dart. This article will focus on TypeScript, which is an open-source language developed by Microsoft. 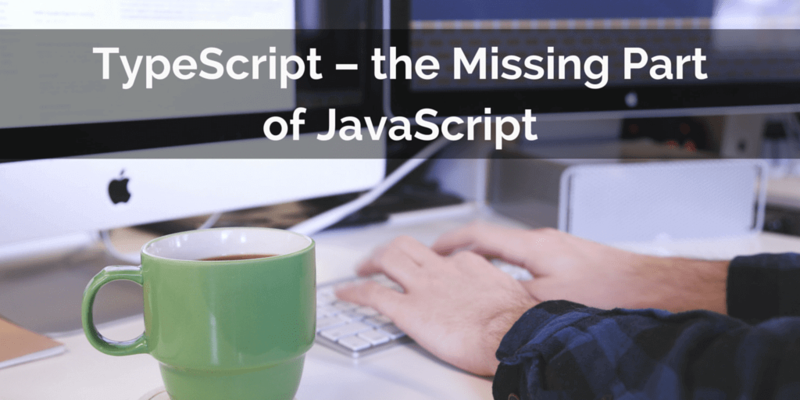 As it is just the superset of ES6, tech-following front-end developers should be familiar with it. in your console. The compiler will compile .ts files into .js files. It will also throw an exception if there is any error in the code. This is a huge advantage of TypeScript – it shows the programmer what is wrong with his code at the early compiling stage. The name ”TypeScript” comes from the typing system. That is the major attribute of this language. It might be uncomfortable to use types if someone was close with ES5, but it has many benefits. It all depends on who you are, and what you’re going to do with code. If you are a programmer, you can avoid many bugs during the compiling time – a console will throw an error if types are not compatible with the expectations. Going through the code, you can quickly notice what the author of the code had in mind when he was writing it. Also, if you want to use some function for your own purposes, you can see if it will give you the expected result (like a type of return). Java, C++ or any other typing programming language users know this benefit very well. Let’s see some examples! Function calls will return “Hi Tomek” and “Hi Example Name”. The string was passed to the function, as it was expected, and the function returned the string, so the compiler won’t throw any errors. app.ts(9,10): error TS2345: Argument of type ‘number’ is not assignable to parameter of type ‘string’. Classes are like prototypes in ES5, which may be quite confusing as it’s not the same for typical OO language. So let’s get familiar with it a bit. To define a class, you have to use the class keyword and give it a name. Now create some class called Employee and later you will add something to it. Each class can have its own properties, methods, and constructors. Take a look. Methods are functions executed only in an object’s context. Before you can use a method on the object, you need to have an instance of this object. So first, let’s create a method called greeter that will say “Hello” to our newly created employee. Add this method to the Employee class with properties that were introduced above. There is a shorter way to declare a variable and initiate class. TypeScript allows you to have only one constructor per class. A constructor is a special function that is called when a new instance of a class is being created. It should be used when you assume some initial setup for new objects. The constructor’s name must be constructor (keyword). It can take parameters, but it doesn’t return any value. It happens this way because this function is executed when a new object is created, so it has no value to return. Let’s create some constructor that will parametrize your new object. You can also make some default value for any argument. It should be useful when you have to fill some key with the value and you know that this value will be the same for many objects. In both cases, the employee’s position will be Developer, because “Developer” is a default value for the position attribute in the constructor. If the argument position is optional, you don’t need to pass it and the constructor will fill it to Developer automatically. In this case, you got your employee name, surname, age and position set, when the object is created. Open your index.html file in a browser, run console and test it. You can read the properties of objects that already exist (first, second), you can call methods for them or you can create your own object by using the constructor.